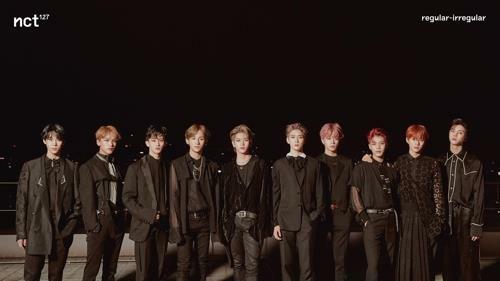 SEOUL, Oct. 23 (Yonhap) — K-pop boy band NCT 127 landed their latest full-length album on the Billboard chart of the 200 most popular albums, becoming the second-highest-charting Korean male band, the Billboard said Tuesday. “The 10-member K-pop group sees their ‘Regular-Irregular’ album debut at No. 86 on the Billboard 200, marking NCT 127′s first appearance on America’s definitive albums chart,” Billboard said, referring to the week ending on Oct. 18. “NCT 127 now becomes the second-highest charting K-pop boy band on the Billboard 200,” the chart’s publisher said. The Billboard 200 ranking by NCT 127 is still a far cry from BTS’ two No.1s on the same album chart, but exceeds the 87th spot claimed in 2017 by EXO, NCT 127′s label mate under SM Entertainment. “‘Regular-Irregular’ is also the tenth-highest K-pop entry in Billboard 200 history,” Billboard said. Albums by K-pop girl bands BLACKPINK and 2NE1 have previously peaked at 40th and 61st place, respectively, on the leading Billboard album chart. “Regular-Irregular” is the first full-length album by the subunit of SM’s boy group NCT and was released Oct. 12. It has 11 tracks, led by “Regular,” a Latin Trap number. “NCT 127 is sure to make their city — and fans around the world — proud as the Seoul-based boy band scores major chart accomplishments with their first full-length album,” Billboard also said.